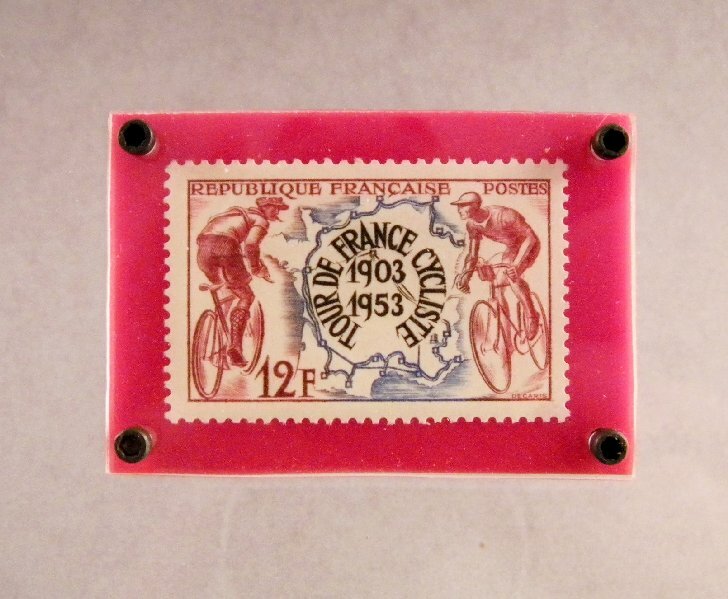 This stamp is from France, and some of the stamps have cancellations, I use both, so they might have had to work for a living. Who knows what it did? A letter to a friend or loved one, or did it pay a bill, I always wonder. The imagery is a woman dressed in the traditional garb of the Champagne district/province of France. The stamp was produced to commemorate the discovery/invention of Champagne, often credited to a monk by the name of Dom Perignon, but let’s face it, wine with bubbles had certainly occurred before. Supposedly, upon opening a bottle he said something to the effect of, "Brothers, I am drinking stars!" I certainly wasn't there, and it's probably one of those make believe moments, but what a great thing to say! At my house I always like to go outside onto the driveway in the backyard and wiggle the cork loose and let it pop straight up, and then try to catch it before the dog grabs it and runs off. Simple things amuse simple minds, I guess. I usually use fillister head slotted screws and blue plastic as pictured here. 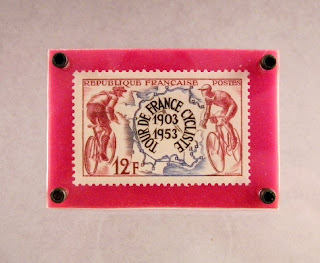 Below is a stamp pin intended to celebrate and commemorate the Tour De France. I've been watching this for years on TV, it's always good. I bought Tour De France hats and water bottles for family members and many times my sister and her children would come up for the 4th of July and we would all watch the Tour, it was great fun! 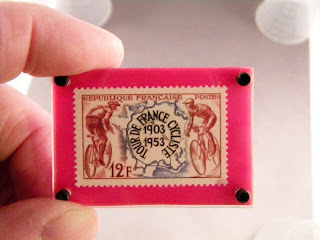 The stamp has got a some what dated look due to the fact that it was made in 1953, the 50 year mark, for the Tour. I've had other tour De France pins, this is just all I have in stock at the moment. I'll add more as supply is replenished.